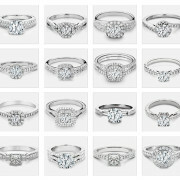 One of the most popular ongoing trends for engagement rings is that of white diamonds set into bright white metal. This white jewelry look is very modern and clean and has maintained its popularity for quite some time now. To achieve this all-white effect, diamonds are set into either platinum or white gold. Platinum is naturally a very white metal, but is the heavier and more expensive option. White gold is less costly and a lighter metal, but isn’t naturally a bright white colour. Therefore, white gold jewelry is almost always plated with a rhodium coating as standard practise in the industry. Pure 24K gold is only found in one colour, and that is yellow. However, 24K gold is extremely soft and unsuitable for jewelry purposes, so the pure gold is mixed with other metals to create better working properties. This process is called alloying, and it can also be used to change the colour of the gold. White gold is created when pure gold is mixed with at least one other white metal, such as palladium, manganese, nickel, silver or zinc. 14K white gold is 58.3% pure gold while 18K white gold is 75% pure, with the remainder being a white metal. Although white gold is much whiter than yellow gold, it still has a slight shade of yellow or gray. It gained its popularity for jewelry use in the 1920s as a less costly alternative to platinum. In the 1930s silversmiths began rhodium plating sterling silverware as they found this reduced the tarnishing and therefore the constant need to polish. This was then applied to white gold as well, as it made the jewelry look much whiter and similar to platinum. Rhodium is a member of the platinum group of metals and is quite rare and expensive. It is hypo-allergenic, highly resistant to wear, tarnish and corrosion and it has high light reflection. Solid rhodium is rarely used in jewelry as it is extremely expensive and is a very brittle metal. It is much more cost effective and practical to use it as a plating. The official name of this process is called electroplating, where the piece of jewelry is submerged in a heated bath of rhodium solution and then an electric current is run through the bath using the jewelry as a cathode. This causes the rhodium in the solution to bond onto the jewelry. The solution is a mix of sulfuric acid, phosphoric acid or a combination of both, mixed with rhodium and water. A relatively small amount of rhodium can be used to plate many jewelry pieces, keeping the cost of the process down. The one drawback of rhodium plating is that it will wear off over time. The length of time depends on a few factors, such as the amount of wear and roughness the ring receives, its exposure to environmental factors and the wearer’s own body chemistry. Some people can wear a rhodium plated ring for three years before needing a re-plating, while others will need it re-plated more frequently. It is not wise to re-plate more than once a year because, while the rhodium plating doesn’t affect the jewelry, the jewelry does needs to be thoroughly cleaned and re-polished to remove all the old plating and re-polishing removes trace amounts of metal. This won’t affect your jewelry, provided it is not done too frequently, although over-polishing will eventually impact durability. The plating does not affect any diamonds or gemstones which are set into the metal, although it could affect some natural materials such as pearls. At Kimberfire we provide complimentary cleaning and re-plating up to once a year for any of our white gold jewelry pieces, to ensure they maintain their bright white colour. Whenever you are purchasing white gold jewelry you should ask the jeweller about rhodium plating and if they include re-plating in their care policy, as it is important to know all the costs to be incurred in properly maintaining your purchase. White gold jewelry is both beautiful and popular and it is essential to know how to keep it looking its best throughout the years. Comprehensive article. I will always recommend choosing white gold over platinum as you can restore it to near new appearance with rhodium plating. Once Platinum gets a few dents and scratches on the surface it is very hard to return it to its original condition. Thank you for your comment! You are right, platinum is definitely the more difficult of the two to polish, but we find that an experienced jeweler can bring both to a beautiful shine. As such, we don’t have a stated preference towards either white gold or platinum – both have their pros and cons. We’ll always educate our customers on the properties of each metal and leave the selection up to them. Best article to choose the gold which we should buy and also this article is good for safety aspects of gold jewelry. Read this full article before purchase of gold.